For centuries people have taken advantage of the sun’s radiant heat for comfort. Simple homes of stone or clay were built to capture the sun’s rays, retaining it for the evening hours. But, as we approached the 21st century, technology took a quantum leap and the ROI was apparent for both the manufacturers and consumers. 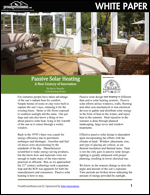 This white paper, sponsored by Solar Innovations, takes a look at passive solar heating, a building technique that utilizes windows, walls, flooring and other non-mechanical or non-electrical devices to gather and distribute solar energy in the form of heat in the winter, and reject heat in the summer.